Wax moths can do large-scale damage in a weak beehive. They destroy the wax comb, which ruins the colony’s ability to raise brood and store food. But they don’t usually become a problem in a strong and healthy hive, because bees continually patrol the hive and remove any wax moth larvae they find. If you see wax moths, therefore, you probably have a weak colony. So keeping your bees healthy and reducing hive boxes and frames to correspond to colony size are the best defenses against wax moths. Once you have an infestation overtake a weak colony of bees, there is nothing you can do to get rid of them. It’s too late. The story is different when comb is stored for winter. With no bees to protect these combs, the wax is highly susceptible to invasion by wax moths. But in this case, steps can be taken to keep the moths from destroying the combs over the winter. 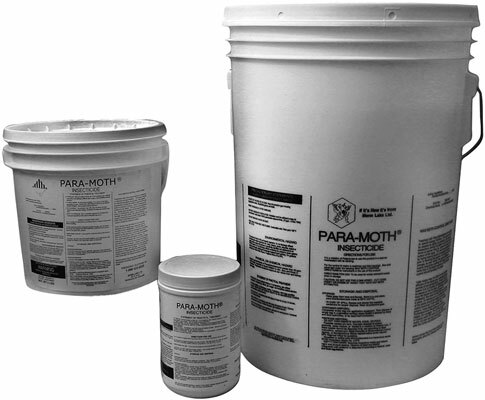 The use of PDB crystals (para dichlorobenzene, or Para Moth) on stored supers and hive bodies can kill the moths and larvae that would otherwise destroy the wax. Credit: Courtesy of Mann Lake Ltd. This product is not for use on supers that have contained or will contain honey for human consumption. Follow product instructions carefully. You can destroy wax moth larvae by placing the frames in the deep-freezer for 24 hours. If you don’t have a big freezer, you can freeze two or three frames at a time. After they’ve had the freeze treatment, put the frames back in the supers and store them in tightly sealed plastic garbage bags. The colder the storage area, the better.